All evidence suggests that America today is not a happy place, with every poll showing a strong majority believing the country is now and has long been headed in the wrong direction. That misery is reflected in much of serious contemporary theater. Plays aimed at adult audiences are most likely to delineate depression, despair and death. So it is a nice change of pace to view a play that makes nary a nod to angst and tragedy. 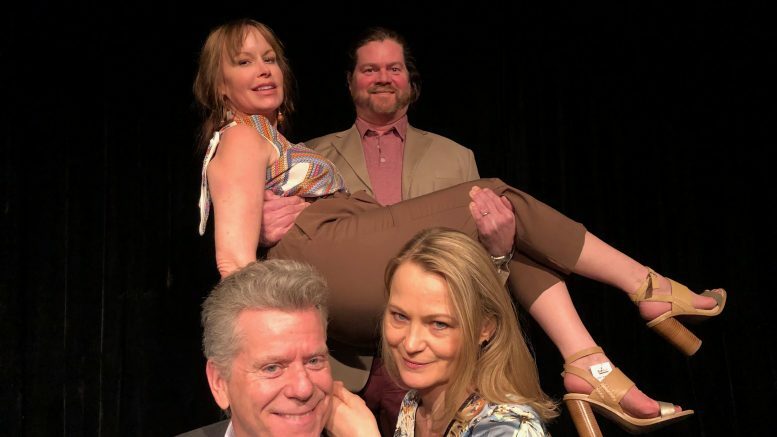 “Meteor Shower,” which the Fusion company opened March 21 at Albuquerque’s Cell Theater, is a slight, frothy one-act cartoon, fit for a series of skits on “Saturday Night Live.” It is no coincidence that the playwright is an alumnus of that comedic staple of NBC television. Steve Martin also happens to be the nonpareil master of modern comedy on stage and in movies as well as on television. “Meteor Shower” is not one of his masterpieces—it ran on Broadway for only three months after opening in November 2017. But it is from beginning to end good fun. You can’t call it clean fun because the characters do get down and dirty, in multiple ways, but no matter what the sneaky twists of the plot, the fun is always first and foremost. Even when one character does die, he quickly comes back to life, apparently no worse for the experience. The meteor shower of the title is both a literal celestial event and a metaphorical blast transforming the lives of a young couple, Norm (Bruce Homes) and Corky (Jacqueline Reid ), who cope with each other through a screen of self-healing ploys drawn from pop psychology and relationship manuals. The bearers of the metaphorical meteor shower are a second couple, Gerald (Matt K. Miller) and Laura (Celia Schaefer), who are older, more sophisticated and hell bent to trigger no end of mischief. The encounter between the two couples in the home of Norm and Corky is repeated. Earlier, real and metaphorical meteors bring on a variety of dire consequences for the young hosts. Later, the tables are reversed and it is the guests who get their comeuppance. To avoid a spoiler, I won’t go into more detail about the reversal. Director Robb Sisneros and the quartet of unusually experienced actors—Fusion veterans Holmes and Reid, Miller from Los Angeles, and Schaefer from New York—skillfully present the playful, over-the-top, cartoonish conflict between the two contrasting couples. Their costumes and body language nicely complement their contrasting verbal tics. Producer Dennis Gromelski said he’d calculated that the quartet had a combined 153 years of acting experience. “Meteor Shower” will run through April 6, Thursday and Friday at 7:30 p.m., Saturday at 2 p.m. and 7:30 p.m., and Sunday at 3 p.m. All performances will be at the Cell Theater, 700 1st St. NW in downtown Albuquerque except Saturday, April 6, a 7 p.m. pay-what-you-will performance at the KiMo Theater, 423 Central Ave. NW in Albuquerque. Be the first to comment on "When meteors fall"